Termites are one of the costliest of all insects. They are a threat to 70% of the entire world and to every part of the United States except Alaska. The South Carolina coast is in the heart of the highest threat zone. 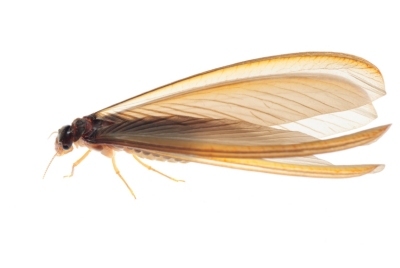 Here in The Grand Strand the most destructive termite we encounter is the Eastern subterranean termite. These termites are social insects, living in large, organized colonies of 60,000 – 300,000. They are small, only about 3/8” long. The workers, which are the most numerous members of the colony, are whitish in color and wingless. These are usually found in damaged wood. They are responsible for the mud shelter tubes you may see along your foundation or in your crawlspace and the tracks in your walls, windowsills and baseboards. Once a colony becomes large it produces swarmers. Swarmers are 3/8” to 1/2”, have four translucent, silky wings with dark bodies. During spring and early summer, usually after a rainfall, the colony sends huge numbers of swarmers (see our blog) out to establish new colonies. They exit the colony through holes in the ground, cracks and crevices in your structure or through tiny exit holes they create in your structure. These are the most visible members of the colony and almost always signal termite activity and most likely, damage in your home when found.